Costume Fundraising Now a Bridge Action! – OTVIIIisGrrr8! Costume Fundraising Now a Bridge Action! “Per COB, Costume Fundraising is a 100% ‘on policy’ action designed to boom the Ideal Orgs. The new GAT II OT IX Costume Fundraising level can be delivered at any Org. “GAT II OT IX includes hatting on the exact technology of Ideal Org costume fundraising, including the theft of copyrighted property for costume fundraising,” Delusion noted. GAT II Preclears Going Exterior With No Perceptions! I know I’ll get declared SP for this but I wish George Lucas would sue the living hell out of Birmingham org for desecrating Darth Vader like that. You just had to say it Mr. Smarty Pants! You could have kept your big yap shut but nooooo. You just had to say it and now COB is pissed and screaming and breaking everything in his War Room. Looks like another long and godawful night at the Base for we in RTC. Your SP Declare is in the mail. We have also ordered your folders culled. So THAT is how you get the fundraising calls to stop! My thanks to Scientology411 for revealing the secret to Ideal Silent Phone and Empth Mailbox. You are a true hero to take a bullet for the troops! I thought religious freedom laws prevented wogs from suing Scientology for copyright infringement. Scientology should be allowed to sue anyone for violating our copyrights while being allowed to use everyone else’s copyrights as needed to clear the planet. 1. Be three feet back of your costume. 2. What about a costume could you confront? What about a costume could another confront? What about a costume could others confront? What about a costume could have you confronted? 3. Spot a costume, walk over to it, touch it, let it go. 4. Mock up a costume, make a copy of it, let it go. 5. Spot a costume, tell me its color, weight, now let it go. Please welcome Perry, our new C/S Costume Fundraising. Perry is here to help you get a reality on Costume Fundraising and to program your Costume Fundraising intensives. I do not send the part where they pickpocket the wallet. Is that on one of the upper costume fundraising levels? It is truly marvellous with all the missing tech popping up all the time making the Bridge much more logic and complete and exactly the way Ron wanted it! I think we should all commend COB in a BIG WAY for his relentless search for lost tech and for never giving up, despite being met with so much resistance and hostility from degraded beings and SP´s! His ability to look handsome and stay uptone and continue his magnificent leadership of the church, even in difficult times, is awe inspiring!!! Bravo! We in RTC wish that all Scientologists were as gung ho as Birgit. She is so KSW that she is Miss KSW. You are just a darling, OTVIII, and I love your comment!!! Kisses and hugs from Denmark!!! There is a precedent… some guy in Rhodesia, although I don’t know if he fundraised. Do you think these folks are slaving away in the MEST universe? They’re visiting the Van Allen belt, vacationing on Mars, or perhaps time traveling on the whole track when they’re not shilling for COB. Find out the freedom and power that comes with the Scientology Super Power Super Hero Costume Fundraising combo pack. Set your coordinates to Clearwater and beam on down today! Scotty is making sure the Transporter Room is staffed 24/7. Captain whostolemycog, I am truly glad you do not work for the Church because you’re so dangerously convincing. You’re one of the few people who really get how the scam works. And what scam would you be referring to, Mr. J. Swift? J. Swift is an SP and the SP engages in suppressive acts. If J. Swift posts again on this blog we in RTC will ban him for life. We simply will not allow suppression and entheta on this official RTC site. But Mr. Delusion, what about the Doctrine of Fair Exchange which dictates that for spiritual well-being, “anytime a person receives something, he must pay something back” and balance “inflow” with “outflow.” Doesn’t merely giving something away, money for example, run counter to this central tenet of Scientology? I’m confused! And what’s all this talk about a scam? “”Advanced Courses [in Scientology) are the most valuable service on the planet. Life insurance, houses, cars, stocks, bonds, college savings, all are transitory and impermanent … There is nothing to compare with Advanced Courses. They are infinitely valuable and transcend time itself.” – L. Ron Hubbard speaking of his “Operating Thetan Courses” Flag Mission Order 375. Donating money for advanced courses to rocket up the Bridge to total freedom is one thing OTVIII. I’m all in favour of that. I’m talking about donating money to Scientology and getting nothing in return, no courses, no vitamins, nothing, just a bunch of people jumping up and down clapping. Where is the inflow from your cash outflow? That’s not the Doctrine of Fair Exchange, that’s giving away money and getting diddly squat in return. This puzzles me! I‘ll say it again, giving away money and getting nothing for it runs counter to this central tenet of Scientology so why do people do it? Seems delusional to me. My apologies to Ken for using the word “delusional.” I bet he gets that all the time. Johnny L. it ARCx’s the hell out of Ken Delusion when people throw his name around in mockery. This happens too often and is a charged area for Ken. HOW can you sit here in public and say that you get “nothing” for the money you donate to Scientology???? Really now, how about a CLEARED PLANET for starters?! Is that NOTHING??? How do you expect Scientology to clear the planet without money??? Huh……..??? I think those donations are the best value for money you will ever get!!! FACT is: The more you donate the faster the planet will be cleared by Scientology!!! We have been informed about this time and again for years now at all Scientology events. Haven´t you ever listened to and really seriously understood any of COB´s speeches? EVERYBODY needs to back up COB and support him in every way possible, NOW!!! He is mankind´s ONLY hope!!! I don’t want no stinking buildings with people jumping up and down clapping. And to hell with mankind — those stupid wogs pulled it in! It’s all about me Birgit! You just don’t understand. You see Mr. Hubbard has made some serious promises that I want to take full advantage of. – recall anything I have ever studied. – do mental computations which a normal person would do in a half an hour (1800 seconds), in 10 or 15 seconds. – a vigour, persistence and tenacity to life which is very much higher than anyone has thought possible. – better eyesight which in time will become 20/20. – full color-vision, tone-sonic, tactile, olfactory, rhythmic, kinesthetic, thermal and organic imagination. – and an IQ rise of as much as 50 points. – entirely without psychoses, neuroses, compulsions repressions and psycho-somatic ills of any kind. Then after I become Clear it’s on to the OT levels where I will become a superior being with the power to control, create and/or destroy matter, energy, space and time. I can’t wait! Buildings? Are you kidding me? Over time we have seen many a scientologist, who has donated vast amounts of money to the church, proclaim that donating in a BIG way was just as good as – and in some cases – even better than auditing. I´m thinking maybe you just haven´t donated enough yet. You must keep on donating until it hurts in order to achieve results in Scientology!!! Also – I think we all know how hard COB has worked for the last 30 years to set things straight after the mess Hubbard left behind. The definition of CLEAR, as you and Hubbard describe it, is no longer valid. It was just one of Hubbard´s countless exaggerations to get customers in the shop. In order for the church to be able to deliver what it promises, a CLEAR today is just someone who feels a bit better than before he became a scientologist. I myself can – after having spent over $1,000,000 on Scientology – attest to the fact that I AM a Scientology CLEAR according to this new definition. And I´m just looking forward to donating more!!! Birgit gets a special trophy from COB for stating the “New Clear Cog” with VGI’s: “A CLEAR today is just someone who feels a bit better than before he became a scientologist” — and they donate and donate and donate! So merely donating money for buildings and cheap applause is just as good as or even better than auditing. Really Birgit, you actually expect me to believe this? And the definition of CLEAR as Hubbard described it is no longer valid. What? Are you kidding me? You actually expect me to believe that a CLEAR today is just someone who feels a bit better about himself — and all the promised superpowers are just exaggerations! Come on! You must think I’m a real idiot. I suppose the next thing you’ll be saying is that LRH was a conman and that Dianetics and Scientology is just a huge scam. Yes,my dear Johnny! Much has changed since L. Ron´s departure from planet earth. As you probably know, every single auditor – even those educated by L. Ron himself – has had all his/her certificates cancelled by COB, because L. Ron was so confused when he was around that he didn´t know, what he was doing. It took COB more than 30 years to find all the lost tech that L. Ron and many other SP´s had been hiding from him and rewrite all the materials and edit the tapes. Yes, even the tapes had to be edited, because more often than not L.Ron would just be babbling along without any of it making any sense and COB was left with no other option than to delete it. While working singlehandedly on this monumental task, COB came to the realization that while L. Ron was around and even quite a while after his departure the blind had been leading the blind. This of course means that L.Ron had been blind and we had all just blindly been following him. Thank God, Jesus and Maria this has all changed now because of COB, who worked tirelessly day and night for 30 years at editing all the materials and putting them right. Today – according to COB himself – ALL the materials in Scientology are completely on source and exactly the way L. Ron wanted them! This of course means that ALL scientologists must buy ALL the new revised materials and redo the entire Bridge so as to be completely up to date and WITH the new program. I think that is what OTVIII´s article here was all about in the first place. NOTHING in Scientology is like it was before, when L. Ron was around! I believe you have a bit of catching up to do, my dear Johnny! Dear Birgit, you poor naïve fool. 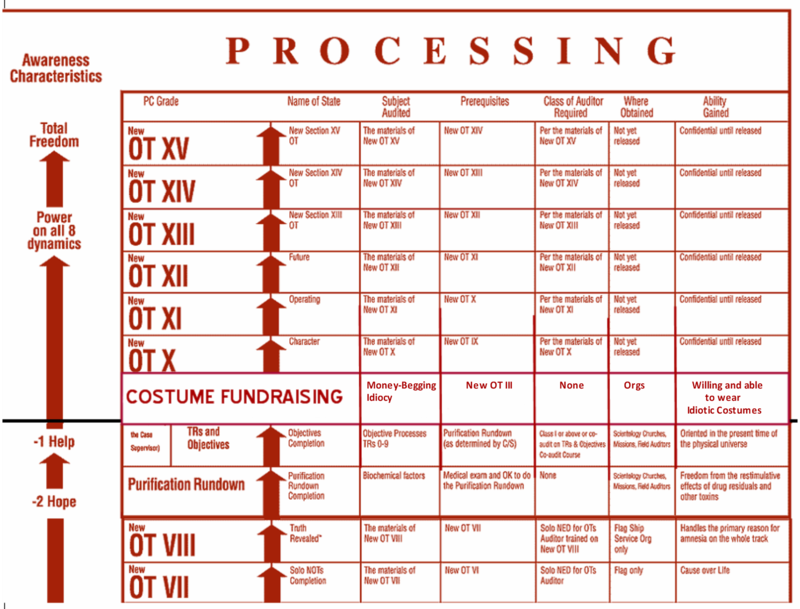 OTVIII´s article here is all about “Costume Fundraising Now a Bridge Action!” As if dressing up in superhero costumes and having people clap their hands while jumping up and down is any substitute for meticulously applied tech. I’ll soon be up there, on top of the world, an OTVIII, easily finding parking spaces, changing green lights and finding the shortest line — and you’ll be stuck down here with vague memories of a party and the empty sound of clapping hands ringing in your ears. Johnny L – How dare you!!? Of course “Dressing up in superhero costumes and having people clap while jumping up and down” is no substitute for meticulously applied tech. Why? Because it is meticulously applied religious tech!! I don´t know much about “meticously applied tech”. I mean, I can´t even spell it, much less understand it. What I do know is, that people get case gain from donating. And the more they donate, the more case gain they get. This is a proven fact!!! I don´t think much studying or auditing is going on in the church anymore. The main activity is fundraising and getting people to donate. Dear OTVIII, Birgit is claiming here that people get case gain from donating and the more they donate the more case gain they get. Is this really a proven fact or has she lost the plot? Ha ha ha Johnny, you are too funny!!! Watching this video actually made me feel quite nostalgic about all the events I attended in Orange County. People were so sincere and I remember one woman actually got tears in her eyes when she talked about the Ideal Org and what it would do for the planet. Sometimes the food was pretty good too. And it was entertaining. I almost wish I could believe in the little tin god but on the other hand, if I did, I’d then feel bad that I can’t donate as much as others. And can anyone out there tell me how I can get my order of expulsion? I was told verbally that I’m out but I’ve emailed Theresa at AO trying to get something in writing and she won’t respond. Pingback: New and Easier “Sec Checks Lite” Feature 50% Less Brutality! | OTVIIIisGrrr8!